Over the past few weeks, I’ve had a serious ramen craving. Blame it on the weird weather; blame it on the weirder than weird situations I’ve been in over the past four months. You could also blame, I think, having to deal with somewhat difficult people over the same time period. But, regardless of whatever reason, I wanted ramen. The good news is that there is actually a very good ramen-ya just a short walk from where I work now. The bad news is that the place is packed to the gills with people at lunchtime. But, in my case, fortune favors the desperate (or the seriously depressed, for that matter): and a need to have dinner before diving into the increasingly worse homeward traffic led me right up to Ramen Kuroda. Tonkotsu ramen is the specialty in this particular shop, which is to say that noodles are tossed into a bowl of silky, savory, collagen-rich pork broth upon serving. You know the sort: pork bones and cartilage are cooked down with seasonings to yield a milky-looking broth that is said to do wonders for your skin. Here, you can have your broth as is (shiro – white), given a shot of fiery tomato-chili miso paste (aka – red), or with an inky-looking splash of roasted garlic tare (something of a heady, savory black garlic confit) as in the case of the kuro ramen and kuro chashumen. Here, Php 180.00 gets you a bowl of ramen (regardless of variant) with half an ajitama (soy-cooked mollet-style [firmer than soft-boiled but not quite hard-boiled] egg) and a slice of chashu (roast pork belly). However, PhP 230.00 gets you a chashumen – a bowl of ramen with ajitama and four slices of pork. Believe me when I say you’re good to go shelling out extra cash for the extra chashu. What you get is a bowl of firm, chewy noodles – thinner, perhaps, than what other noodle shops sell, but a generous amount cooked al dente, nevertheless – soaking up that rich, porky-tasting soup. The addition of the black garlic tare in either the kuro ramen or chashumen adds a smoky richness, a somewhat vegetal tang, and a delicate sweetness that tempers and is tempered by the smoothly rich broth. You would think that a ladleful of the stuff would make the soup far too pungent for comfort, but it doesn’t. In fact, it’s deliciously subtle – and you needn’t worry about garlic breath if that’s what worries you. By the way, the amount of broth also warrants an extra order of noodles (kae-dama); don’t fight it, go with it, and enjoy it. 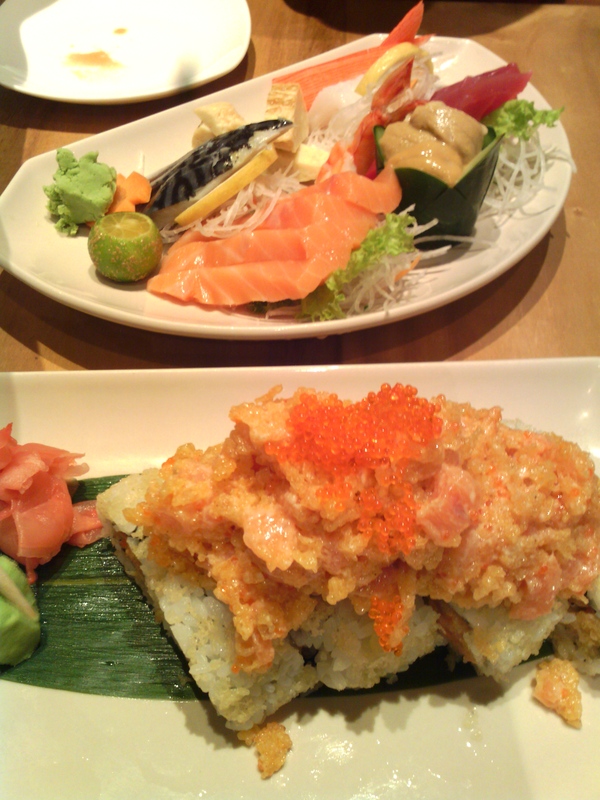 Yoshoku is the collective term used in Japan for western dishes that are given a distinctive local twist. The most popular examples of this particular culinary style are kare raisu (rice topped with a curry gravy that is much milder than any South Asian original), omuraisu (tomato rice wrapped in a thin egg omelet), and beef hash or beef stew. The term further extends to American dishes that the Japanese have made their own. One delectable example I encountered recently are the Osaka BBQ Ribs over at Tokyo Bubble Tea. Now, while it’s rather unusual to get a square meat at what is, essentially, a teashop, it’s one of my go-to places for lush, proper lunches that are more than satisfying. TBT’s spin on a Southern classic really delivers in terms of taste, texture, and quality. A section of pork belly ribs are marinated in a sweet mix of tangy barbecue sauce, a hint of honey, toasted sesame seeds, and soy. After being grilled to perfection, more sauce is drizzled over and extra sesame sprinkled on top. So soft, so tender, you can shred it with a spoon! The end result is a section of ribs that fall apart almost as soon as you start prodding it gently with a spoon. Each bite is delightful: a proper balance of lean meat and unctuous fat, all beautifully flavored by the sauce with a smoky hit from its time on the grill. The corn slaw and grilled veg that come with it are an excellent textural counterpoint and the sharpness of the grilled tomatoes are a nice way to offset the sweetness of the pork. My tip: skip the mashed potatoes and go with the garlic rice for some extra-flavorful oomph in your meal. 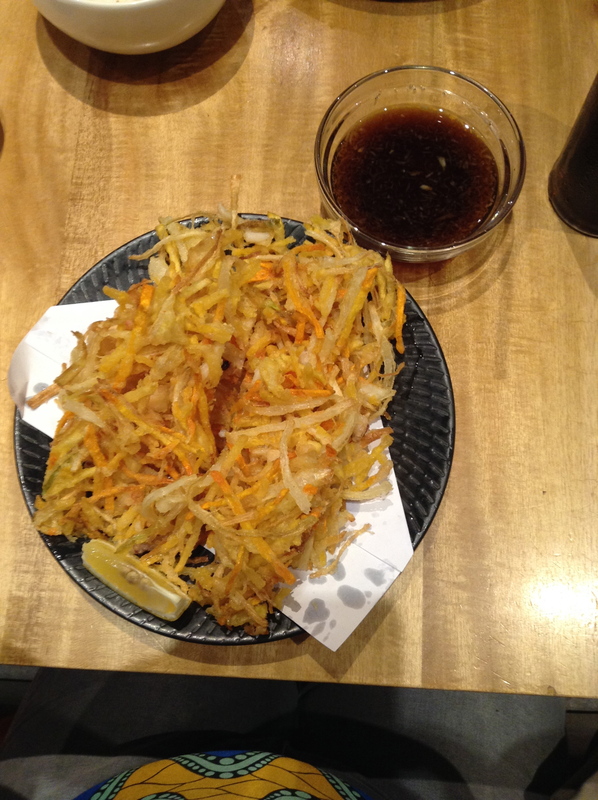 Kaki-age is a variation on the standard tempura recipe that involves shredding a number of vegetables, mostly root veg, and tossing them into a very cold, lightly seasoned batter that fries up into a shaggy-looking fritter that, if done right, is crisp all the way through. The name is something of a misnomer because the literal translation of kaki-age is “fried oyster” (kaki = oyster; age = cooked in hot oil / fried), but I have never encountered actual oysters featured in the dish. (I have heard about the corn and oyster kaki-age over at Ooma at the Megamall, but I’ve hadn’t had the opportunity to go there and taste for myself.) As stated previously, it’s predominantly made with vegetables. In the Philippines, this is usually a combination of carrots, sweet white onions, potato or sweet potato, and kabocha pumpkin. In the case of restaurants like Kenji Tei and Teriyaki Boy, bits and bobs of prawn, squid, and crab are sometimes added to add a savory and slightly fishy twist to something whose basic flavor is essentially sweet and earthy. There have also been spicy versions wherein the brilliantly colored and aromatically incendiary shichimi togarashi was added to the batter for a touch of heat and zing. This is what happens when the Christmas rush kicks in: you find yourself scrambling from one mall to another trying to find appropriate presents (or, if you’re like me, the appropriate ingredients for whatever it is you’re planning to give away as presents), you hop aboard public transport, get stuck in two hours of standstill traffic, scramble like a madwoman from store to store, hoist several bulky packages on your person, get stuck in an additional two hours of traffic, manage to get home, and slump to the floor in exhaustion. Fortunately, in between rushing to and fro, one can fuel up and rest those flagging feet and spirits for a while. In this case, I was off to my old standby: Tokyo Cafe. TC offers a selection of set meal menus that feature a bowl of soup, a small salad, a saucer of pickles, hiyayakko-doufu (cold tofu salad), rice, and a main course. 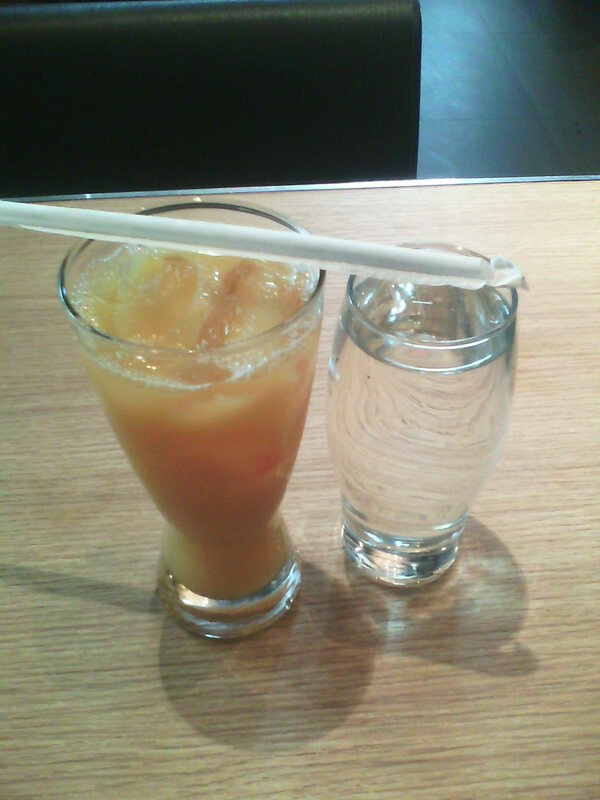 Throwing in P 60.00 gets you a drink and you can opt for iced or hot coffee or an iced orange juice. 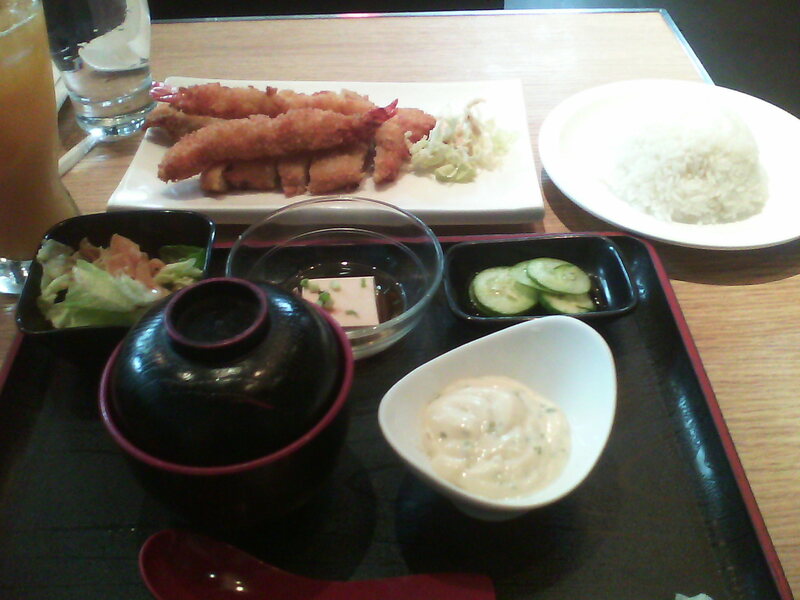 Shown here is the Namban chicken set which features torikatsu (breaded chicken fillets) and ebi furai (deep-fried breaded prawns). Seriously, it may not be at the top of the class given that the breading was heavy and the soup tepid at best, but it was enough to add a bit of spring back into my step and get my Holiday shopping done. When my sister turned 24 on Saturday, we were actually in a dither as to where to have her celebratory dinner. We’d ordered in Chinese food for lunch earlier in the day, but a serious Nihonophile like my sister deserved a proper Japanese meal. Fortunately, my brother called up just a little after lunch to tell us that we were going to have dinner that evening at Kenji Tei. Kenji Tei has to be one of the more underrated ramen houses in the Greater Manila Area, seeing how people would more likely go to Japanese franchises like Hokkaido Ramen Santouka or Ramen Yushoken or to more popular dives such as Ukkokei or Mitsuyado Sei-Men. But the food is good: amazingly simple yet delicious and quite decently priced. We each opted for a regular sized bowl of our ramen of choice – and the regular size is actually big enough to be shared by two particularly hungry diners! 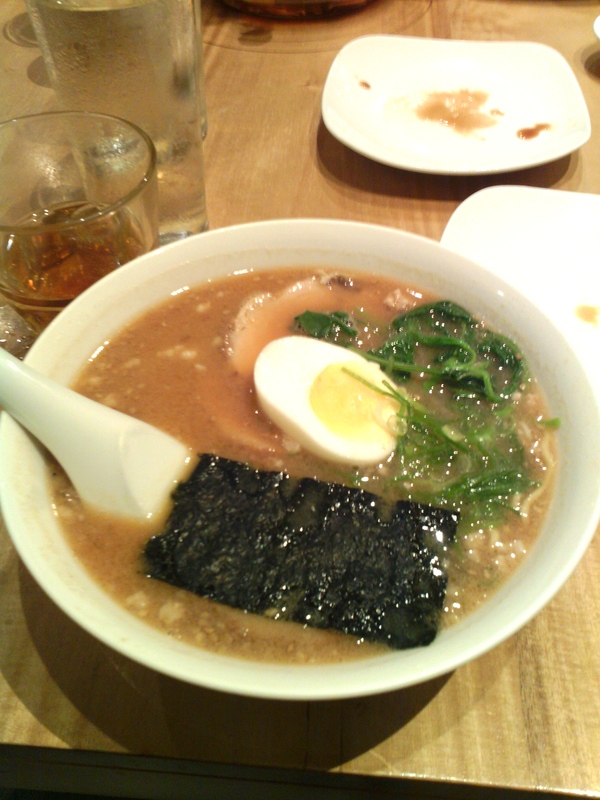 My bowl of choice was the chashu miso ramen (P 268.00 for the regular size). This was a fairly large, deep bowl filled with semi-hard wheat noodles in a rich, nutty miso broth with a bit of a smoky nuance added by toasted sesame seeds. Along with generous bits of pork mince, scallions, and spinach, this dish actually takes its name from the three thick slabs of beautifully-cooked chashu pork that are floated on top of the dish along with half a medium-boiled egg. You would do well to order an extra couple slices of the chashu pork as it really melts in the mouth and has a rich, almost ham-like smokiness to it. You would also have to order an extra bowl of noodles (P 40.00 per bowl) to help sop up the generous broth. It was definitely a meal that really made my sister’s birthday – and one I would definitely enjoy again one of these days.